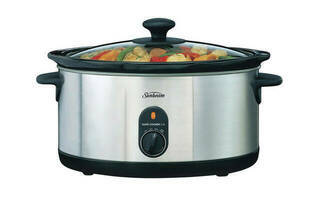 Snapshot: The Sunbeam SecretChef Slow Cooker 5.5L HP5520’s capacity is a medium-sized 5.5L. How easy is it to use and how well does it cook? Bowl has small handles with no grip (so can be difficult to lift when full). Bowl is large and heavy (so can be difficult to fit into a dishwasher or even a domestic sink). "Heats your home as well as the food inside!" 02 Jun 2018, Grant P.
We've had this slow cooker for many years and it's very easy to use and clean. Good recipe book, large capacity, easy to clean. The metal outer gets so hot I've burnt myself many times. It's dangerous, and as the previous review states, is not energy efficient as a lot of heat is wasted being transferred to air. I can't understand metal outers - the original Crockpot had an insulating plastic shell keeping the heat in where it's meant to be! Inner ceramic crock is very heavy. And it was dropped and it broke. So now we have a perfectly functioning base but we can't buy a replacement inner. Another example of poor practice by manufacturers increasing waste to landfill. 01 Aug 2016, Timi U.
I got a good deal on it. The handles are nice. This is not a very energy efficient device. When you put it on high the outside of the unit gets extremely hot (too hot to touch). It radiates so much heat the counter below gets alarmingly hot. As a result of this inefficiency it takes hours to get a full pot to boil on high. Long before the water gets boiling the handles get too hot to touch so you can't reposition the device easily. Unless you want to use it as a means to heat your kitchen I would not reccomend this product. I am going to return it. 20 Jun 2015, Jim H.
Slow cooking is a way of life in by 7am, ready fully cooked when you walk in the door. Corned beef, Chicken and lamb all come out juicy and tender. I have tried several slow cookers but rate this one great and easy to use. Makes amazing soups and stews. A large kitchen item so leave it on the bench and use it daily. Sure it would take up room in the dishwasher but would you store your car in the shed!